Can Being Sensitive Make You Sick? I hated going to malls. I preferred isolation rather than crowds (and just a few people could mean a crowd to me!) I preferred to be among animals than most humans. I managed to live alone and work alone from home, and avoided true emotional intimacy with most people. And I managed to justify it all, never really inquiring why I was this way. And then I got drunk. “No big deal” you say? Well, it is if you don’t drink any alcohol. Yes, that’s how sensitive I was to other people’s energy! Western science talks about mirror neurons; they are in many ways responsible for empathy. They mimic what we see and feel in others… in ourselves. Some say we’re mirrors for each other. I take it one step further: many of us are emotional sponges. And the more sensitive you are, the more you can absorb energy from other people—even if you’re not in their physical presence! After working almost exclusively with Highly Sensitive Persons (HSPs) and writing a book that’s been on Amazon’s Top 20 in its category for 19 consecutive months, I can surely say to you that if you’ve been depressed, fatigued, anxious, sleep deprived, or are dealing with digestive disorders, or pain and tightened muscles, and you think you may be even the slightest bit overly-empathic, there can be a correlation. If you feel stuck or can’t intuit like you’d like to, or can’t really be there for others in a way that lights you up, or aren’t following your Divine nature, there can surely be a correlation to your heightened, untrained sensitivity. How could you not be depressed if you’re carrying the sadness of others? How could you not be anxious a/o sleep deprived if you’re carrying the mental confusion of others? How could you not have tightened muscles and pain if you’ve absorbed the anger of others? How could you not be overweight a/o fatigued if you’re carrying the weight of others’ burdens? Picture yourself carrying other people on your back. That’s the physical equivalent of these types of energetic transfers. How long can you do this without it affecting your health? You could certainly continue to avoid crowds. You could play small in fear of emotional overwhelm. You could even wall yourself off from anyone or anything that drains you. But that’s not living your dreams, is it? That’s fear-based avoidance, rather than love based inclusion and growth. There are specific techniques for HSPs that help us prevent being an emotional sponge. There are even more specific processes for healing the HSP when all else has failed. They’re all in my book, Self-Care for the Self-Aware: A Guide for Highly Sensitive People, Empaths, Intuitives, and Healers. When you can manage your gifts—and they are gifts when used well—the world opens up to you! What you’re looking to manifest becomes dramatically easier to experience or attain. You’ll be more Divinely guided than ever, and can help others in a bold and new way that won’t drain you. If you prefer more personal assistance, schedule a F.R.E.E 15-minute Getting-to-Know You Consultation. I’ll be able to tell you if you’re carrying the energy of others, and how much. I’ll be able to intuit if you’d receive what you need through what I can share with you in a full session or if you’re best served elsewhere. I love sharing my gift with you. And I know you want to share your gifts with others, too! It’s what we’re here for. But if you’ve been unable to do so at the level you’d like to, my techniques can be just what you’ve been waiting for! Please comment below, and "like" or share on Facebook. 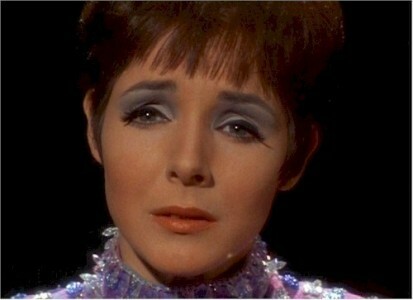 Photo is of Gem, the Empath in the episode of the same name from the original Star Trek. She was able to consciously absorb the pain of others, transform it, and then be okay. Clearly, she went back in time and read my book.